Pictured are, from left: Vicki Fern, Heather Rivera and Kimberly Bahata, who have been named finalists for the Nightingale Awards of Pennsylvania for 2018. 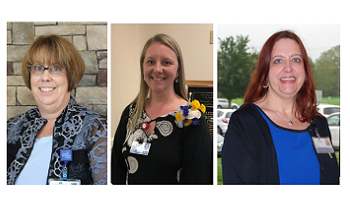 Kimberly Bahata, regional director of case management operations, WellSpan Health; Vicki Fern, care coordinator, WellSpan Sechler Family Cancer Center in Lebanon; and Heather Rivera, clinical nurse, WellSpan York Hospital, are among the 27 statewide finalists in 10 award categories. Bahata is a finalist in the “Nursing Administration – Leader/Manager” category, Fern in the “Community Nursing” category and Rivera in the “Clinical Practice RN” category. The finalists were selected from more than 100 nominations received from across the state. Last year, Abigail Strouse, D.N.P., director of clinical services, WellSpan York Hospital, was the winner in the “Nursing Administration – Executive” category. In 2016, Emily Huggins, manager of WellSpan York Hospital’s forensic nurse examiner program, was the winner in the “Community Nursing” category. And in 2014, Leah Birch, nurse manager of pediatrics, was the winner in the “Nursing Administration – Leader/Manager” category. “Nightingale Awards of Pennsylvania” finalists will be honored, and the winners announced, during the organization’s 29th Annual Gala Friday, Oct. 26, near Harrisburg. The “Nightingale Awards of Pennsylvania” is a statewide philanthropic organization whose purpose is to create, cultivate and support environments where professional nursing achievements are valued. For more information, visit www.nightingaleawards.org.